Getting to know some of the basics about any new lake can provide you with information that can make your visit a pleasurable adventure rather than a “nightmare experience.” Our shallow lake makes for some significant challenges. Kangaroo Lake gets its name from its shape which resembles a Kangaroo with its head (North end), pouch or hands (mid-east side), and feet (south end). The north end is an established no motorized boating area. Peil Creek runs into the north end and Heins Creek delivers water over the dam and runs into Lake Michigan. There is one primary boat landing designated by the Town of Baileys Harbor on the mid-east side of the lake, off of Highway 57. There is adequate parking, boat ramp, and an adjacent pier. “Lake Michigan-size” power boats, and in particular, larger inboard or inboard/outboard motors, are generally too large and powerful for our shallow lake. The “power” disturbs the bottom of the lake preventing the establishment of healthy plants needed for fish. At the primary boat launch and some other lake access points, you will find some “Warning Signs” about the critically important practice of making sure your boat and trailer is cleaned before and after you enter/exit the lake to avoid the spreading of invasive species. To help prevent spreading aquatic nuisance species, fishermen and boaters should familiarize themselves and comply with Wisconsin aquatic nuisance species regulations. Being familiar and complying with these warnings cannot be over emphasized. The KLA and Wisconsin’s DNR strive to manage the spread of invasive species, including Eurasian Milfoil and Viral Hemorrhagic Septicemia (VHS), a deadly fish virus, and can only be successful with everyone’s cooperation and vigilance. Here's a great video on why keeping your boat clean in important. You’ll want to familiarize yourself with the shallow areas of the lake. There are several rock piles and extended shorelines that can be disastrous for a power boat or a mid-sized sailboat with a deeper draft. The south end of the lake contains a Slow No Wake zone identified with buoys designed to help protect the remaining bulrushes. These important plants prevent shoreline erosion and provide habitat for invertebrates that provide food as well as shelter for young fish. Bulrushes should not be disturbed anywhere in the lake. 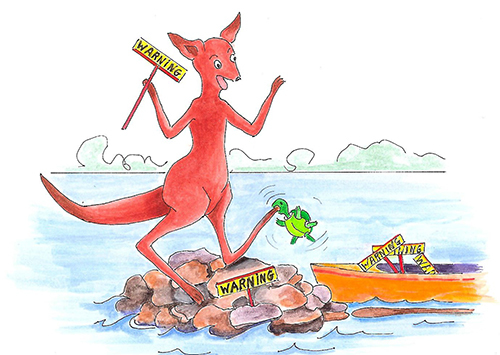 State boating regulations require that all motorboats must operate at speeds below Slow, No Wake speed within 100 feet of the shoreline, dock, raft or designated swim area. Therefore, for those towing water skiers, the pick-up and drop-off sites should be at least 100 feet from the shoreline. Note that for Jet skis (PWC) the Slow, No Wake speed zone extends to 200 feet from the shoreline. Per the regulations, Slow, No Wake speed means “a speed at which a vessel moves as slowly as possible while maintaining steerage”. There are additional regulations for towing a person on water skis or other devices with which you should be familiar. These regulations are intended to protect the safety and biology of the water along the shores. KLA is encouraging avoluntary slow, no-wake zone of 500 feet from the shore and encouraging motor-boaters and jet skiers to avoid shallow portions of the lake where possible. Kangaroo Lake is an ideal lake for canoeing, kayaking, and wind surfing. It is an excellent way to enjoy and learn about the lake’s ecosystem and shorelines. There is a small swimming area on the mid-west side of the lake at the end of Kangaroo Lake Beach Road. The causeway that separates the north end of the lake from the south end, has four large culverts that allow access for fish and provides an enjoyable fishing experience for the entire family even without a boat. It is important to be familiar with Wisconsin’s fishing regulations. Please note: there is a special minimal size of 18 inches and bag limit of three for walleye in Kangaroo Lake, beyond the standard State of Wisconsin size and limits (Administrative code NR 20.20 (15)(d). This is to help the walleye population through enabling more fish achieve breeding age. There are bountiful nature, hiking, animal sighting, and leisure opportunities in the areas around Kangaroo Lake. Bicycling and jogging around the lake and on our “back roads” is another way of enjoying our surrounding beauty.For more information on these topics, visit our Explore Kangaroo Lake page.